Scrubbers, dryers, industrial vacuums and high-pressure washers increase safety, hygiene and efficiency in food production. A partner should know what you need in the food industry. Nilfisk does. Nilfisk solutions are used in food companies to improve production efficiency, increase safety, and maintain a high level of hygiene. All of our solutions are ATEX certified and in compliance with GMP standards. 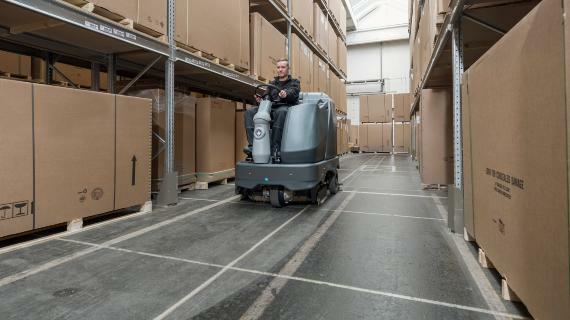 Keep floors in magazines, production and packaging areas safe and clean with our floor care machines. 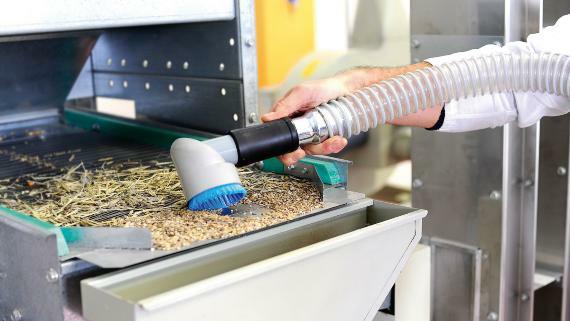 Collect any kind of dust or granule with specifically- designed industrial vacuums for systems and ovens. Convey any kind of raw dust or granule mixture into the automatic machines. Explosive dust from volatile ingredients like flour and sugar is a persistent danger in food production. ATEX-certified vacuum cleaners minimize the danger of explosions and assure a healthier environment at the same time. 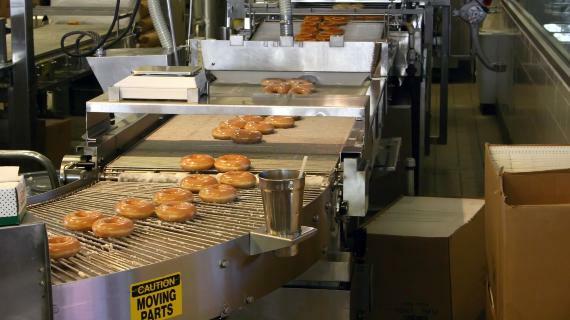 Hear more about the products and solutions we recommend to make your bakery production run more smoothly. 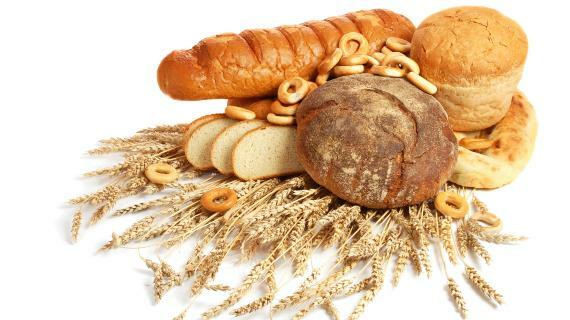 Keeping the inside of your ovens free of burnt crumbs, flour or any other production waste helps avoid contamination of the product. 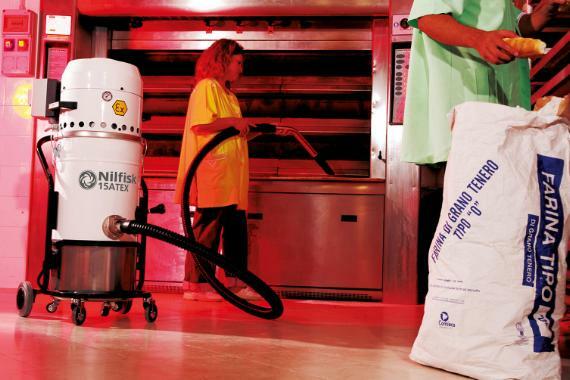 Nilfisk recommends using industrial vacuums equipped with our Nomex filter, which is self-extinguishing. You can also customize your vacuum cleaner with a wide range of optional accessories specifically designed to recover hot materials. 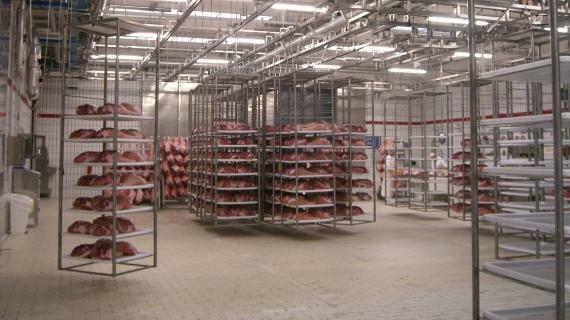 Your food production site may need to be classified as an explosion-proof environment. Using ATEX, Hazloc, or IeCex Nilfisk certified industrial vacuums will increase safety and product quality. 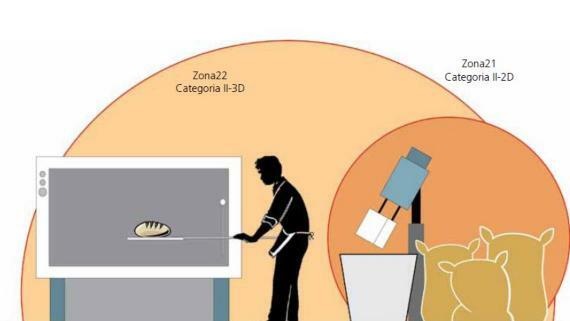 Burnt crumbs, flour or other production waste can contaminate your product. Using an industrial vacuum allows you to continuously collect production waste. For large production lines, a centralized vacuum system might be the right solution. Daily cleaning of production lines saves time and money. Industrial vacuum cleaners and hot or cold water high pressure washers can make a difference. They eradicate bacteria and germs, but also save money on extraordinary plant cleaning and prevent damage due to machinery downtime. A wide range of scrubbers and dryers for any kind of floor and for each surface extension. Nilfisk products are designed to maintain a high level of hygiene and quickly eliminate dirt, increasing safety at work. With Nilfisk, daily cleaning can create a more pleasant work environment. 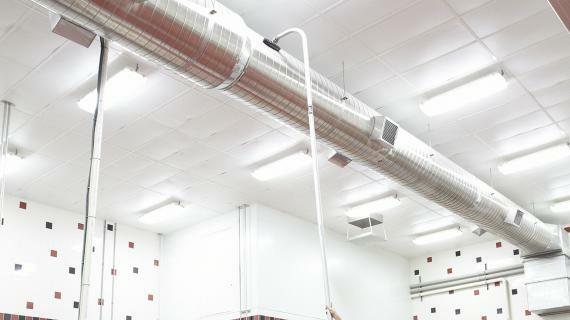 Dust and particles that accumulate on the ceiling beams of industrial plants often cause problems. When the dust falls from suspended pipes and beams onto the production lines and machinery, this can cause technical malfunctions and contaminate the product. Cleaning of large areas with a large amount of debris takes a long time with traditional tools. 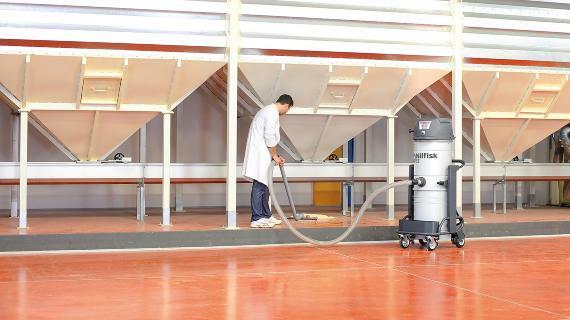 Using Nilfisk combination machines, you can immediately reduce cleaning time and resources devoted to it. You’ll increase productivity and safety in your production facility. 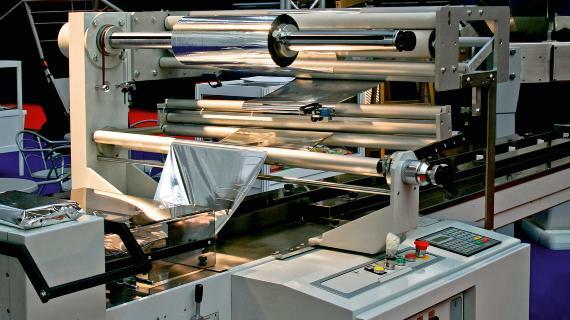 During the packaging process, the cutting machine produces waste, scraps and trims. Nilfisk ”R” series industrial vacuums are specifically designed to continuously collect trims while preserving the product. 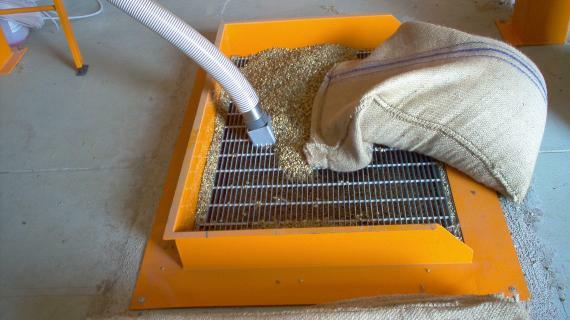 Nilfisk pneumatic conveyors are designed for transferring powders and grains. Taken directly from bags, drums, big bags and other containers, the coffee is released at a certain distance, at the desired times and in the desired quantities. Capsules and pods, before to being packed, are brushed. The resulting powder is recovered by the Nilfisk centralized vacuum system and returned to the production cycle. Simple, effective, beneficial. In the production of dairy products, proper cleaning and sanitizing of the environment and equipment before and after the preparation of the food is good practice. The goal of a proper washing is not the inactivation of the bacteria from the surface of an object, but elimination of waste, dirt or mold from processing. Nilfisk high pressure washers can slow down or eliminate the proliferation of microorganisms and pests that may compromisee hygiene and the quality of products. Dirt, as part of a dairy farm, can be of two types: organic and inorganic. 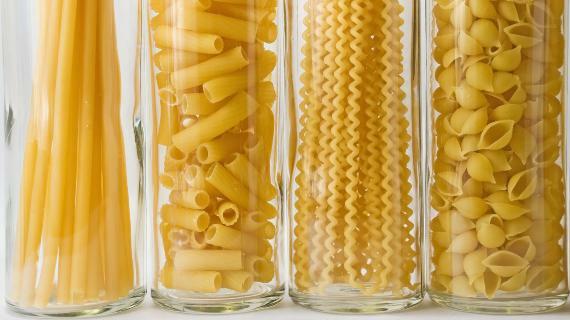 The first is made up of grease, proteins and sugars. The second is the limestone and the stone of milk. Both need to be removed by cleaning machines that can guarantee an effective result also in the daily cleaning. Nilfisk high pressure washers deep clean the equipment, conveyors and tanks quickly and efficiently. Nilfisk offers mobile high pressure washers or stationary pressure washers. The mobile pressure washers are ideal for daily cleaning in small areas: they are light, powerful and reliable. 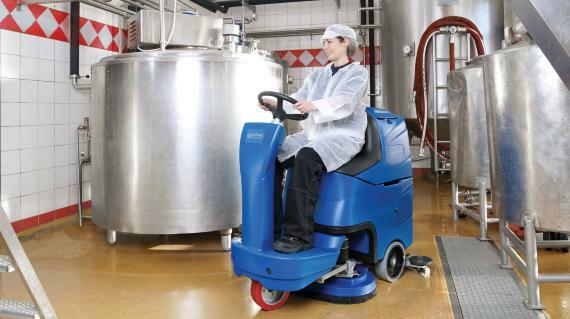 For larger environments, the stationary Nilfisk solution has become a standard in the dairy sector. It offers great added value for cleaning activity in larger environments, even in the most severe conditions. During meat processing, cleaning, disinfection and sterilization of equipment and tools takes place regularly and frequently. 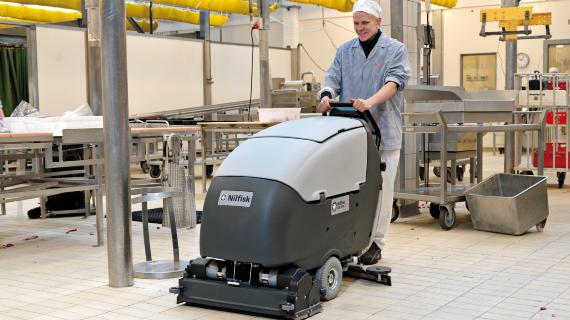 Nilfisk provides any machine necessary for cleaning floors and equipment after processing is finished. The use of the right tools for a deep cleaning and sanitizing saves time, allows work in a clean environment, and comply with regulations. 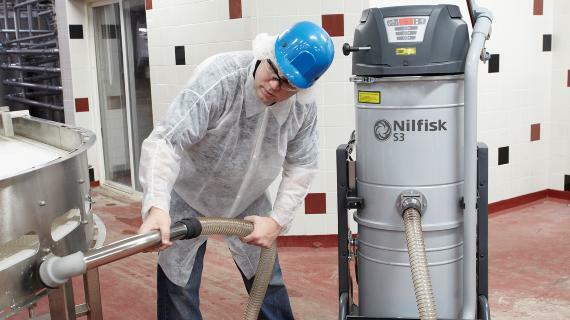 Nilfisk industrial vacuum cleaners are designed to recover meat, debris and liquids in slaughterhouses and are able to separate solids from liquids. After recovery, liquids can be quickly expelled and solid materials can be removed separately. One tool, many benefits. A machine for salting can ensure an absolutely exact percentage of salt, but it cannot adapt to the differences in each piece of ham or notice when one thigh "takes" the salt more or less than another. 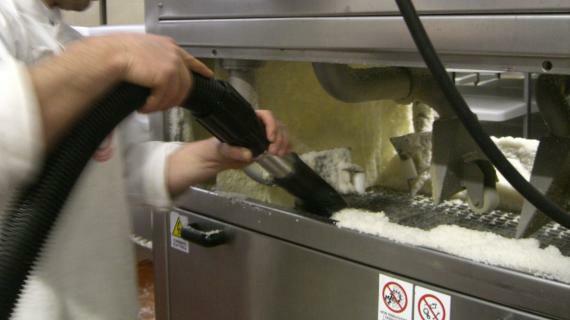 This means many kilos of salt are wasted by the machine and need to be recovered quickly. 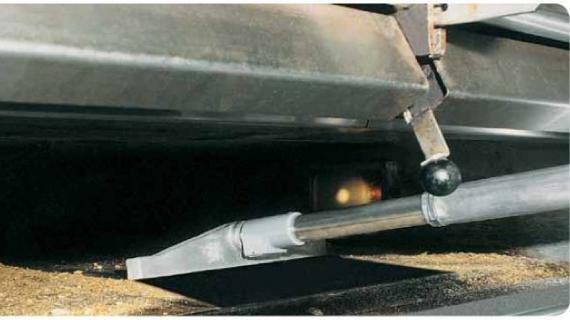 The Nilfisk stainless steel industrial vacuum is used to recover salt and other corrosive material, with assistance from specific accessories and optional add-ons. 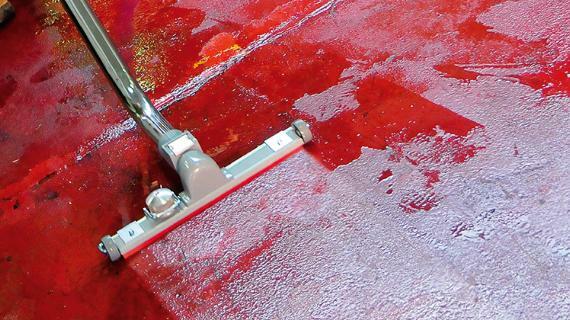 Cleaning a slaughterhouse requires professional tools that can remove all kinds of waste with minimal effort. Mobile or stationary Nilfisk pressure washers,offer a wide range of applications to operate in every area of the production. They’re effective in the meat processing area as well as for the cleaning of floors and even trucks, all in one tool.